Updated on 13/09/2016. Integrated Soil Fertility Management (ISFM) is a set of practices related to cropping, fertilizers, organic resources and other amendments on smallholder farms to increase production and input use efficiency. ISFM delivers productivity gains, increased resilience, and mitigation benefits. 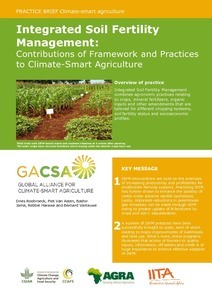 ISFM benefits food security and incomes enhances yield stability in rainfed systems, and reduces greenhouse gas emissions from soils and fertilizers making it of value to climate-smart agriculture.